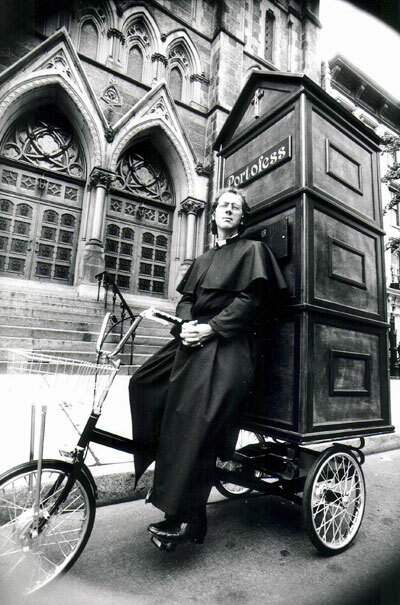 So said Father Anthony Joseph, a Dominican priest from San Bernadino who pedaled a confessional booth mounted on the back of a tricycle to the Democratic National Convention in New York City in July of 1992. Father Joseph (a.k.a. 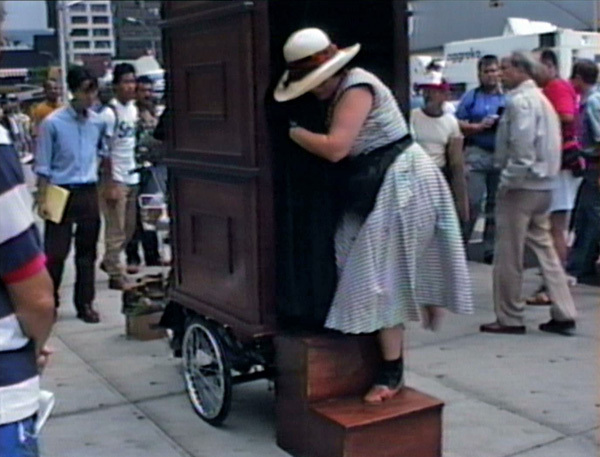 Joey Skaggs) designed, and with the help of friends, built an ornate confessional booth. He had a tricycle custom designed by Worksman Cycles to haul the booth. It had solid rubber tires so there would be no concern of a flat tire, and special gearing for a quick getaway if necessary. 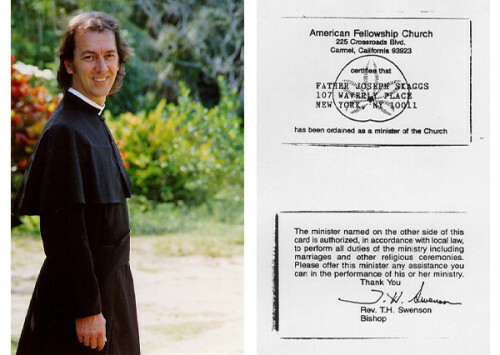 He bought a full priest cassock from a catalog and became a card carrying minister with a $36 license from the American Fellowship Church. Father Joseph wanted to make it easier for the politicians to free their souls by confessing their sins. 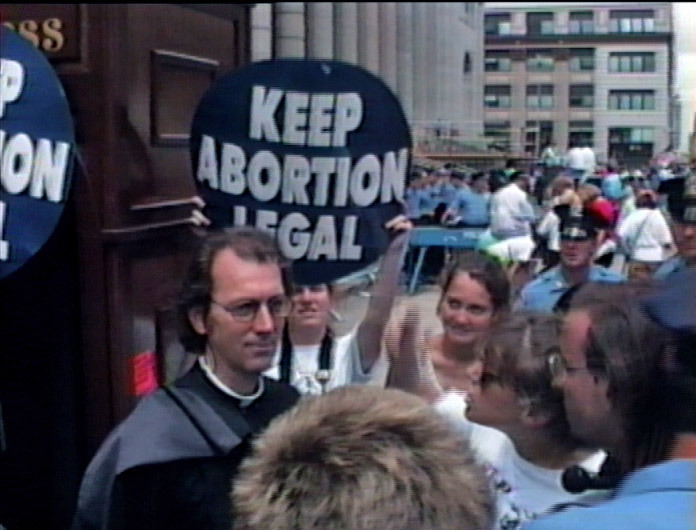 He was soon attacked by pro-choice demonstrators who pasted stickers on his body and on the booth. The New York police took Father Joseph under wing and offered him the kind of protection rarely afforded his alter ego. Thousands of journalists were in town for the convention. And, as it turned out, there was nothing much for them to do. So Father Joseph was swarmed by hungry mobs of reporters with cameras and questions, some of whom had interviewed Skaggs previously during other performances and should have known better. Steve Powers of Fox TV News, for one, had covered Skaggs’ Fish Condos as well as the exposé of his Geraldo Hoax. But he did not recognize Skaggs. He chased the priest who was peddling away as fast as possible, fearing recognition. Once he caught up, he interviewed the priest as if he’d never seen him before. Father Joseph thought it was a miracle. Portofess was widely reported on TV, radio and in hundreds of newspapers around the world. Father Joseph (also sometimes called Father William) was featured on CNN, Fox, CBS and by scores of other news outlets including Reuters and Associated Press. When a reporter finally called the Archdiocese in California to verify the Father’s identity and was unable to do so, the piece was declared a hoax. And none too soon for the good Father. 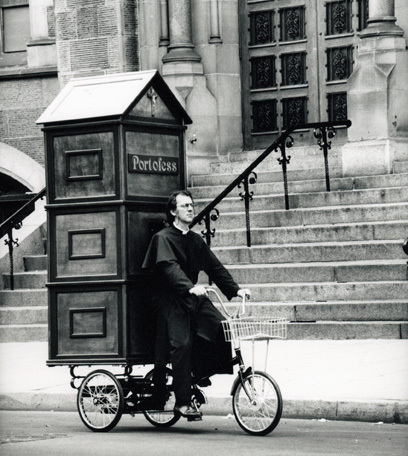 It’s really hard finding a place to park a portable confessional booth in New York City.